Your going to see several Vizcaya Engagement Sessions on my site.. and that's because they always come out so nice. However, I will try and some unique shots so you don't get too board LOL. Vizcaya Sessions are great for clients because they are simple, fast and consistent. This is what people want. They want to be able to go somewhere, and get nice results without having to spend all day, and they want the content to look amazing. Right? 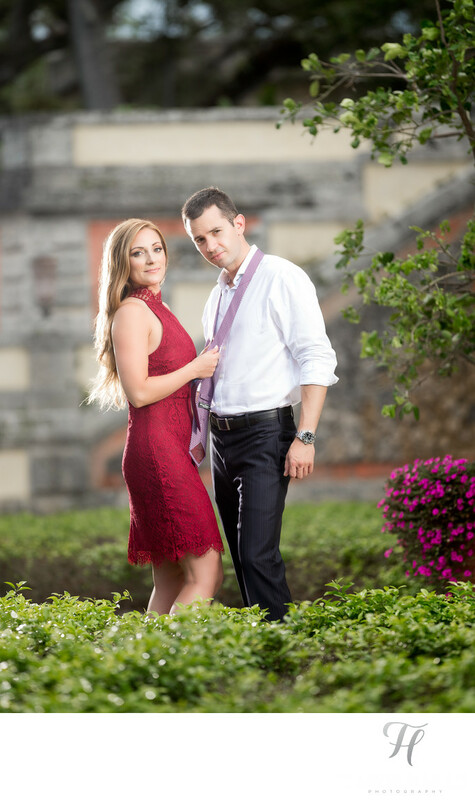 So, this is why Vizcaya in Miami is a very popular choice for photo shoots, sessions, and Weddings. On this shot, we were in the middle of the gardens, and I wanted to "compress" the background (something I do often) so, I shot with my long 200mm lens (this makes the background very soft, and drives attention to my subjects.) The next very big consideration is the lighting for the shot. Here I am using two lights on remotes. One as a main light (in the front) and one in the rear as a hair / separation light. This is kinda my baseline style for most of the shots that I take in most situations. It helps avoid a flat, boring shot and really offers a ton of contrast and range. You can see all the shots from this session here.